Directed by Carles Bover and Julio Pérez. January 02, 2019 “Information Clearing House” – A witch hunt is a dangerous game. It entails a merciless campaign directed against people who hold unorthodox or unpopular views. But, as Jewish history tells us, a witch hunt can backfire and turn the pursuer into the hunted. The Jewish past is littered with witch hunts that boomeranged. In fact, the birth of Christianity contains a classic example of this. Jesus’ persecution began with a hate campaign against a whistle blower who held some radical views, such as ‘love your neighbor’ or ‘turn the other cheek.’ Historically, it was the Sanhedrin war against Jesus that made him into Christ – the message as well as the messenger. Jesus wasn’t the only casualty of such a campaign. The history of Jewish herem (Hebrew for excommunication), tells us that Spinoza was subjected to the apparatus of a similar highly orchestrated witch hunt. In the Jewish world, Herem is the highest rabbinical censure, such a verdict commands that the person suffer total exclusion from the Jewish community and beyond. As with Christ, it was Spinoza’s humanism and universalism, and not the dictates of the inquisitor rabbis, that planted the seeds of enlightenment and progress. While Spinoza’s Jewish contemporaries didn’t approve of the Dutch Jewish philosopher, the Goyim couldn’t have enough of his Wisdom. The Hasbara Handbook indicates that Israel is very concerned that it will be subjected to ‘name calling.’ “Through the careful choice of words, the name calling technique links a person or an idea to a negative symbol. Creating negative connotations by name calling is done to try and get the audience to reject a person or idea on the basis of negative association, without allowing a real examination of that person or idea.”(Hasbara Handbook p 22) It is interestingly that the Hasbara Manual complains that Israel’s enemies employ name calling. The truth is the opposite. Name calling is actually a state policy of Israel. It is certainly Israel firsters’ most popular device. Far more concerning to me is that Jewish so called ‘anti’ Zionists use exactly the same tactics. Jewish Voice for Peace (JVP) and Jewish BDS have been smearing those whom they want to cleanse out of ‘their’ solidarity movement. We have seen JVP and Mondoweiss witch hunting, name calling and issuing their Herem against Alison Weir, Ken Okeefe, Greta Berlin, yours truly and many others. What do these vile campaigns have in common? I will let you guess. Name-calling, witch hunts and herem are designed to stop any lone voice from spreading beyond the walls of the ghetto. At his trial, Jesus was presented by the Sanhedrin as an enemy of the Roman Empire. The Rabbinical body intended Spinoza’s excommunication to impact the church. When Alison Weir is attacked, she is often criticized for her alleged ‘connection’ with white nationalists in an attempt to make the attack resonate with the wider community. I have been slandered as a ‘racist’ although I have never presented a single critical reference to race or biology. What is fascinating about the herem ritual is both its complete lack of mercy and the role it allocates to the Goy. An examination of how the British Labour Party became an inquisitor provides us with a window into the metaphysics of the witch hunt mechanism. Since the election of Jeremy Corbyn as the party’s leader, British Labour has been openly operating as a thought policing apparatus. The party has been played as an instrument of the Zionist global witch hunt. It has been purging, evicting, suspending and expelling some of its best and most ethical members. Ken Livingstone, probably the last true socialist in the Kingdom was suspended numerous times for telling the truth about Hitler, Zionism and Palestine. Hundreds if not thousands of other members have been suspended and/or expelled for supporting human rights in Palestine. The British public has witnessed all of this with dismay. Labour Party members watched their party with disbelief. But none of that matured into any significant protest. This has now changed. Hell broke loose when the Islington Council (Labour) decided to stop me from playing my Saxophone with the Blockheads in one of its venues. Thousands signed a petition expressing disgust with the Labour Council, Hundreds filled complains with the Council. Many others expressed their total dismay with how the Labour Party has managed to fall into every possible trap in this affair. As is consistent with the Jewish past, the witch hunt has boomeranged. This last slander campaign against me revealed an astonishing continuum between Likud and British Labour. When the story made it to the national press, the Labour Party panicked. Like Pilate, it made the wrong decision which has backfired colossally. 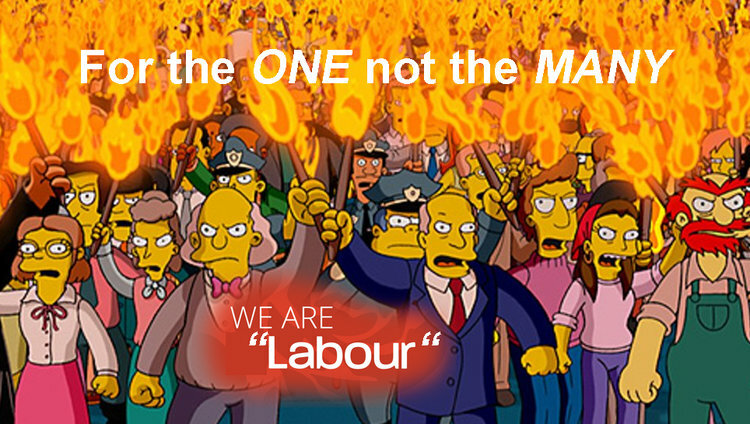 Instead of the people judging me, it is the Labour Party that is under scrutiny. Although many of us are sympathetic to Corbyn, the actual workings of the Labour Party have been devastating and perhaps tragic. The Labour Party is running a Stasi like operation, operating as a hateful opponent of elementary freedoms. If the Labour Party in its current form manages to win an election, it may mark the end to Britain as a free country (assuming that it still is). This might sound like a radical prediction but it isn’t original. Orwell saw it coming in 1936 while in Spain. He was slightly wrong about the date (1984). I predicted this fatal transition in my recent book Being in Time. By no means do I compare myself to Jesus Christ or Spinoza. Instead, I am trying to point out that what is at play here is the classic ritual of a witch-hunt. This time it is the Likud UK instead of the Sanhedrins that has instigated a non ethical anti humane campaign through a proxy operator that happens to be the Labour Party. In this saga, a Labour Council was happy to play the role of Pilate. The Labour Party has been exploring this treacherous role for at least three years. Yet no one seemed to care when hundreds of Labour members were unfairly punished by their party. People have watched the absurd impunity with which Jewish pressure groups have been terrorizing the British media and political universes. But the public reacted differently in my case. First because the idea that the director of Likud UK, a body that in the eyes of many is associated with crypto fascist ideology, can interfere with British culture and politics is sickening. But there is another reason. My offering is a message of hope. It counters the path towards destruction that is advocated by pro war Zionist enthusiasts. It transcends beyond the politicized left/right agenda to exist in the realm of the philosophical and the universal. People seem to take my side because they are expressing their fatigue with the institutional duplicitous narrative imposed on them by the media, politics and academia. People are rallying behind me because this battle is theirs as much as it is mine: they fight for my right to express what they think but are afraid to say.